Hi, a friend of mine gave me 2 new gemstones and has no idea what they are. I looked around and I think the green one is an adventurine but not sure. I also think these 2 stone could be Jaspers. Can anyone tell me what these gemstone are? I could be wrong... Someone else can contribute.. 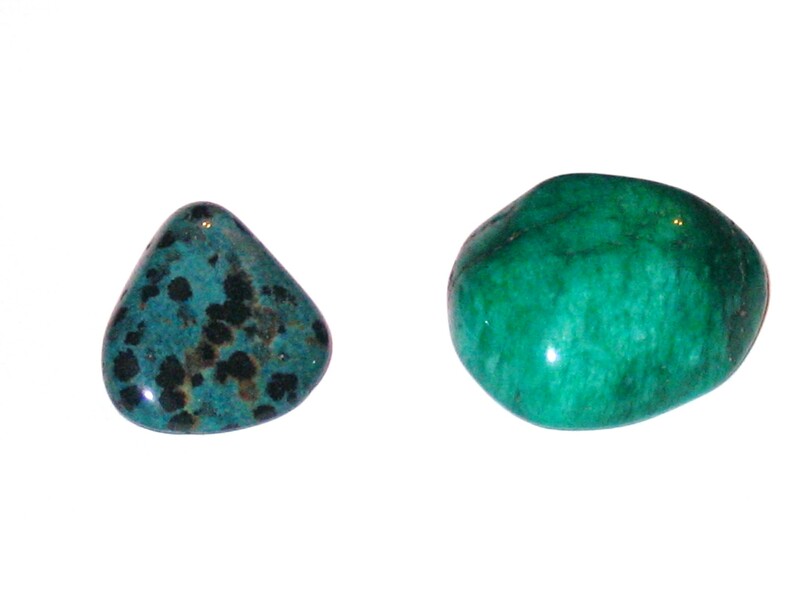 The one on the left could be turquoise, often the bits and pieces left over from cutting or processing turquoise are collected and kinda glued together, these are often dyed also. If the one on the right has a sheen or flashes of color in it - it is probably Labradorite or spectrolite which is a Feldspar mineral. I looked for answers myself for a few days on these two rocks and will look at all the possibilities you mentioned to see if I can figure this one out. The one on the right does not have any tiny sparkly bits if that helps any. The stone on the right looks like Turquoise to me. Not sure about the one on the left.